Today I wanted to talk about one super-easy way you could triple your inquiries and provide a more positive client experience. Every email or phone call is an opportunity to provide a great client experience. However, if you are unfortunately unable to work with that client it can be hard to give an amazing impression. This is where a referral circle comes in. Don’t worry if you have no idea what that is right now, I’m going to talk you through the whole thing. Let’s go! WHY WOULD YOU NEED A REFERRAL CIRCLE? Before we go into what a referral circle is, let’s have a chat about why you might want to create one. Let’s say you’re a wedding photographer and you have an inquiry about a date that you’re already booked for. You obviously can’t attend two weddings at the same time so you’ve got to turn that work down. Now even though you’re turning that work away try not to reply with ‘Hi I’m sorry but I’m unavailable for that date’. This is a really cold and almost a robotic way of replying to someone who has taken the time to look through your past work, read your “about” page and then write you an email. Instead, try to say something along the lines of ‘thank you for taking the time to contact me. How exciting that you’re getting married! Unfortunately, I’m not available for that date but I wish you all the best with your wedding plans and that you have a wonderful future together.’ This is a really good alternative because you’re still saying that you can’t take that work on but are leaving the client with a warm and positive impression of your business. But wouldn’t it be great if you could not only leave a client with a great brand experience but go the extra mile by referring them to someone who you know they will love to work with? WHAT IS A REFERRAL CIRCLE? Well, this is where the referral circle comes in. A referral circle is a group of two or three other photographers in your area who are of a similar style, price level and experience level to yourself. 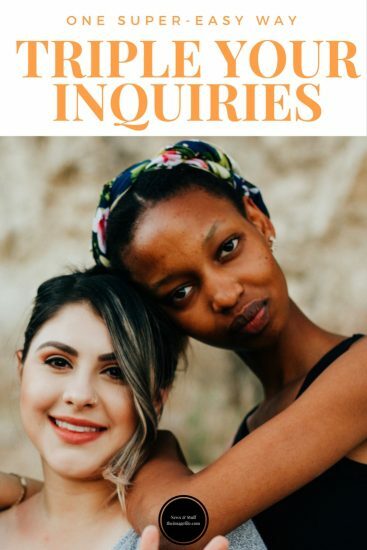 There is a joint agreement between the group that if you receive an inquiry for a date you’re already booked for, you’ll send that client to the rest of the circle. This way you’re not just letting those inquiries float away but sending them on to someone else in the industry who you know will reciprocate and the client will love. This means that you can now add to your response ‘by the way there is this fabulous photographer called _______________ who I think you’ll love. They take beautiful images and I think you’d be a great fit. Here’s a link to their website, social media and blog, and I’ve already checked and they’re available for your wedding date!’ This takes the response from not only warm and friendly but to pretty awesome. SO HOW DO YOU SET UP A REFERRAL CIRCLE? The first step is to research and contact photographers in your area who are at a similar price level and experience level to yourself. You also want them to work in a similar photographic style. By gathering people who are in the same bracket as yourself you are guaranteeing that the potential client base is similar and that any clients referred to you will be looking for what you have to offer. This makes the partnership mutually beneficial. The second step is creating a shared Google calendar. Here you should only note down the jobs that you have booked. So let’s say you’re already booked for a specific date, you can quickly look at your joint calendar and see who in your circle is available for that date. This way you can give that photographer a heads up that you’re sending a client their way as well as send all the necessary information to that client. Finally, if you were referred to a client make sure you say thank you to that photographer. Even though it is a mutual agreement they didn’t have to send you that lead, and it was still an effort for them to check the calendar and pump you up to that client. So even if it’s just a quick email or a thoughtful gift, make sure you show that you appreciate it. This will build and strengthen your relationships and create a culture within your circle that makes you want to refer one another. Are you in a referral circle? How does it work for your business? Are you going to give the referral circle a try?